From 1945 on for two decades, Father William Wade was Chairman of the Department of Philosophy at St. Louis University. This present volume, a recovery of his own 1935 Ph.D dissertation, was originally written under the direction of Vernon J. Bourke, later himself a renowned interpreter of both St. Augustine and St. Thomas Aquinas. Its themes continued to influence Father Wade throughout his life as Chairman and as a teacher of Philosophy. In this last role, he was known for his brilliant use of Socratic method. As a philosopher, he was by the rule of his Jesuit Order, and by choice, a Thomist. However, reading his dissertation one can see his profound respect for Augustine, and back beyond that for Plato, as well as a likely source of his affection for the method of Socrates. In his dissertation, Wade displays deep understanding of relationships between Greek and medieval thought as well as of the different influences of Plato and Aristotle by way of Augustine and Thomas. Centring on their theories of teaching and learning, his text presents accurate, concise, and readable expositions of Platonic and Aristotelian epistemologies, as these were developed by the later saints. Along the way, it offers a fine introduction to the two main streams in medieval philosophy and theology, with their respective logical, metaphysical, physical, psychological, educational, and semiotic doctrines. 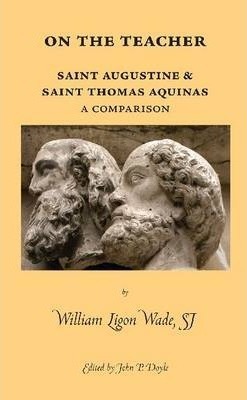 Any modern teacher of historical philosophy can read Father Wade's work for personal enjoyment and for a profitable aid toward classroom instruction. After 40 years teaching graduate courses in Latin Scholasticism at St. Louis University, USA, John P. Doyle retired as Professor Emeritus of Philosophy. He is now Distinguished Professor of Philosophy at Kenrick-Glennon Seminary in Shrewsbury, Missouri, USA. He has published 7 volumes of translation and has produced over 50 articles, essays, and encyclopedia entries, all dealing with figures and themes in medieval and post-medieval philosophy.